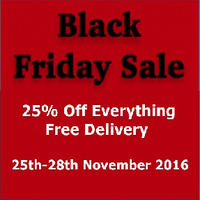 Blog › Information › Brilliant Black Friday Deals at Brilliant Wall Art - 25% Off!!! Black Friday and Cyber Monday are nearly with us - Only 1 week to go! Take a note of the dates this year, the 25th and 28th November. This is one American sales phenomenon which I welcome and embrace every year. Why pay full price for stuff when you can get 25% off at Brilliant Wall Art...? Simply enter the code "16BlackFriday25". Why are these days called Black Friday and Cyber Monday, though? Black Friday has many theories with regards to its origins. I have my own ideas, but choose yours from the list below. Is it one of these, a combination of one or two, or none of these? Another theory is that the term came from a tradition when slave traders sold slaves to plantation owners, the day after Thanksgiving. The term “Black Friday” began to be used by retailers to refer to the single day of the year when retail companies finally go “into the black” (make a profit) after being "in the red" for much of the year. According to police reporter, Joseph P. Barrett, police officers used the term to describe the horrible traffic jams that happened when thousands of people poured into town on the Friday after Thanksgiving. Barrett put together a front-page story for Thanksgiving and appropriated the police term "Black Friday" to describe the terrible traffic conditions. Another theory for Black Friday is on Friday, January 31st 1919, is that it refers to the Battle of George Square in Glasgow. This was a strike/dispute about shorter working hours. Dozens were injured, and as a result the working day was shortened. It was another Black Friday on, Friday 18th November 1910, when hundreds of suffragettes marched on Parliament in peaceful protest and were assaulted and arrested by police. Finally, it has also been used to refer to bad days of battle in the Second World War, devastating Australian bush fires and a peaceful protest in Malé, the capital of the Maldives, which saw police firing teargas on protestors. For online shopping the Monday immediately following Thanksgiving (or the Monday immediately following Black Friday) in the United States is referred to as Cyber Monday. This is a busy day for online retailers, because unlike Black Friday, it applies exclusively to online shopping. Therefore, people can shop online, with similar substantial discounts, for the items they did not purchase on the preceding Black Friday. The term Cyber Monday was first coined by Shop.org and first used in 2005. The UK adopted this marketing technique/ploy in 2009. The list of UK retailers participating in Black Friday and Cyber Monday is growing considerably each year. One such retailer is Brilliant Wall Art. We are the Midlands premier wall art and home accessory specialist. Based in Birmingham, Brilliant Wall Art have been providing decorative metal wall art and home accessories since 2006 with our primary goal being customer satisfaction. The Brilliant Wall Art online site has been designed so that products are easy to find using our handy search tool, or you can shop by category, style, shape, or price. Check out our Black Friday deals online. Whether it is abstract metal wall art you want or a large contemporary sculpture, we make it easy to find the metal artwork you are looking for.